★★★★ The Times Dominic Maxwell is enchanted by the gentle wit of this intimate new staging of the Bard … a fine example of how this studio theatre-in-the-round has consistently punched above its weight. There are times in Andrew Hilton’s production when you want a bit more spectacle, but these are more than made up for by the clarity, intimacy and gentle wit that drives the show. 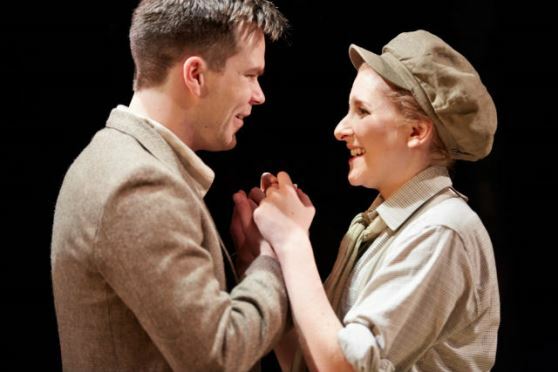 As You Like It is not one of Shakespeare’s most painstakingly plotted plays: it needs to sprinkle love potion on its audience for us to fall under its spell. Yet from the moment that Dorothea Myer-Bennett’s Rosalind locks eyes with Jack Wharrier’s Orlando, it has a palpable attraction at its heart to go alongside its early 20th-century fashions. Harriet de Winton’s set is undecorated, give or take the odd Art Deco standard lamp set, but with a simple dappled lighting effect we believe that a bare stage is a forest. Myer-Bennett is brilliant. Dragging up in exile, she turns male with a baggy peaked cap and a beige summer suit. She screams with girlish glee at the prospect of love, then murmurs with male sonority. She’s a rom-com heroine dancing between emotions with a sure grasp of Shakespeare’s language. She is knowing but sincere: when she comes on for her wedding, it’s as much a pleasure to see her drop the act as it was to see the act itself. ★★★★★ Stage Talk Magazine Soul-shaking love, unrequited love, love at first sight, lusty love, hopeless love – there’s an awful lot of love going on down in Bedminster, Bristol at the moment. And there, in an imagined Forest of Arden where dappled woodland glades are giving safety and shelter to those banished by a paranoid and despotic Duke, a magical theatrical performance by the Shakespeare at the Tobacco Factory Company spins an enraptured audience around itself in a wonderful telling of As You Like It. If you only go to one show this year, make it this one. Now in its fifteenth year since the company’s formation in 1999, this is an ensemble at the top of its game. Its second UK tour this summer will undoubtedly win it a growing army of supporters. In a play that from its outset promises the darkest of outcomes, love is eventually to prove all conquering. This sparkling cast convince on all levels as evil is overturned, the righteous returned to power, and love finds closure down many a different pathway … To pick out individual performances would be to deny the sense of wholeness that Director Andrew Hilton has brought to this group of players. All are excellent. There were standout moments though. With a simple removal of an overcoat Christopher Bianchi as the icy Duke Frederick turned instantly and effectively into his deposed and banished but benign brother Duke Senior. Jack Wharrier had the stamina to convince as fearless Orlando, and the wrestling scene with Charles (Peter Basham), Duke Frederick’s professional thug, was athletic and sweaty enough to win the heart of a very passionate Rosalind (Dorothea Myer-Bennett). I loved Paul Nicholson’s portrayal of Adam, Orlando’s father’s old retainer, and Paul Currier as Jaques strutted with real gravitas amongst his fellow travellers. The players doubled as musicians, and a perfect atmosphere was conjured throughout from accordion, guitar, flute and violin, culminating in a joyous dance scene. The sweet singing of Offue Okegbe, in particular, was a treat. ★★★ The Guardian I must confess to a bit of a love-hate relationship with Shakespeare’s pastoral comedy. I love the idea of it, but I’m often disappointed by it in performance. 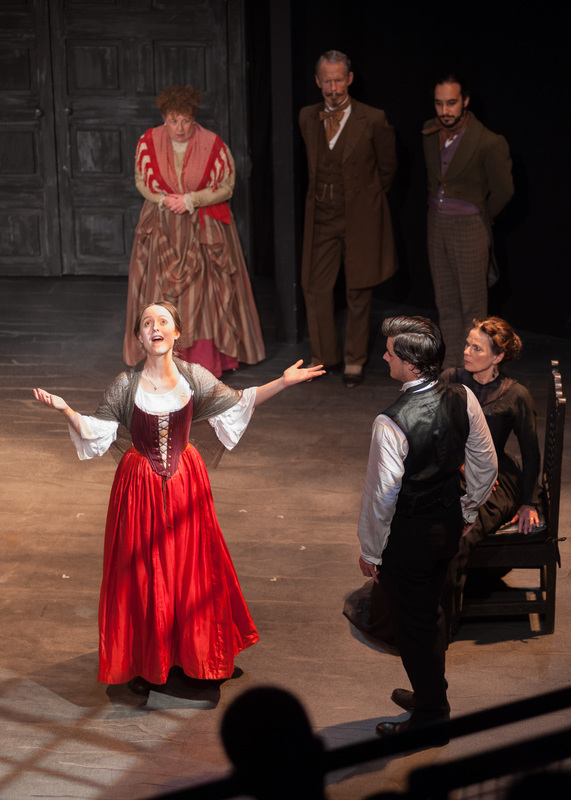 Andrew Hilton’s revival for Shakespeare at the Tobacco Factory, a company that has done so much to make the bard seem fresh to 21st-century audiences, highlights some of the play’s pleasures and flaws. It is sometimes gloriously entertaining, particularly when at its most human in its depiction of the dizziness and pain of love. It is also a bit dull in its exploration of society in a state of flux and its endless wordplay. This production can’t escape the play’s overly schematic structure … Still, there is plenty to enjoy. Touchstone – played by Vic Llewellyn – is quite funny for once and has some entertaining sock business, and there is a hot-headed Orlando from Jack Wharrier, who seems genuinely astonished by love. Dorothea Myer-Bennett’s Rosalind is not as lovable as some Rosalinds, but she is certainly a force to be reckoned with: interestingly her actions often put her relationship with Celia (Daisy May) under some strain until Celia herself is touched by the madness of love. Shakespeare’s most Arcadian play is first placed in France, most probably in the French part of la forêt d’Ardenne, though a possible alternative is another Arden in the Périgord region, close to Bordeaux. A French setting, certainly, is what Shakespeare inherited from his main source, the 1590 prose romance Rosalynde by Thomas Lodge. Lodge’s Orlando-figure, Rosader, is the youngest son of Sir John of Bordeaux and his Rosalynde is the niece of the French King Torismond. Later in Shakespeare’s reworking we may feel – notwithstanding a lion and an olive grove – that he moves the action, seamlessly, to his own local Arden, that large area of farmed land and dwindling forest which stretched north-west from the River Avon in Warwickshire. Certainly, that is where some of the new characters he brings to the story – Audrey, William, Touchstone and Sir Oliver Martext among them – may more properly belong. But the world to which Shakespeare refers – and in which lion and olive tree cause no surprise – is neither France nor England but a mythical one inherited from the Greek and Roman poets and identified with Arcady. That he grounds it in elements of reality and contemporary concern is central to his purpose. To wayward winter reckoning yields. Libraries of pastoral poetry and romance have come down to us from the classical period and the Renaissance. Marlowe’s and Raleigh’s poems (Raleigh’s representing the ‘anti-pastoral’ mode) may now be the most commonly remembered, but the educated Elizabethan would probably have thought first of the Eclogues (poems on pastoral themes) of Vergil, Dante, Petrarch and Boccaccio, or of Spenser’s The Shepherd’s Calendar or of Sidney’s Arcadia. For the Elizabethan aristocracy in particular, pastoral was a key genre, and the shepherd the central character of both lyric and narrative works which ranged from the merely escapist to profounder meditations on city versus country, to religious and political allegory, and to satire. In the simpler mode, these shepherds – unlike their real-life namesakes – are creatures of leisure, articulate and whimsical. They sit on grassy knolls, or by babbling brooks, on sunlit May mornings, playing on pipes and soliloquising or discoursing of passion, while their grateful sheep safely graze. They are remarkably well educated, often composing poetry stuffed with classical reference; and they rarely seem to work. Their life is, you might say, an urban dream of pastoral content, the only shadow commonly passing over them being misfortunes in love. Pastoral remained a key mode into the eighteenth century in poetry and art and also found expression in the landscapes of William Kent and Capability Brown. Even the layout of the stately home itself figured in this; the elegant proportions of the 18th century dairy of Kenwood House, and its elevated position commanding fine views over the park, are said to have been designed so that great ladies could spend leisure hours there playing at being milkmaids. Although it is unworldly – because it is unworldly – uncomplicated pastoral answers a longing central to romance. Hero and heroine, while they invariably have the education and sensibility that only the wealthy can afford, have no burden of status or inheritance. Unlike their readers, therefore, they are free to love whom they will. No-one is watching over them, planning their alliances or measuring their wealth. Love is passion, pure and untramelled. In ‘Rosalynde’ Lodge makes few concessions to reality. All his characters, aristocrats and shepherds alike, exchange carefully crafted verse; the shepherd Montanus sings his own sonnets, adds to them Latin tags, and at one point is so anguished that he is moved to express himself in highly-wrought rhyming French – see the excerpts we reprint later. Shakespeare plays with the dream, but also questions and subverts it. His Arden romance is shadowed by “the icy fang and churlish chiding of the winter’s wind”, by Jaques’ bruised cynicism, and by a central game of love that is in some respects deadly serious. Alongside the primacy of the fictional shepherd in the aristocratic imagination was the very real importance of sheep-farming in the fifteenth and early sixteenth century economy. British wool fetched good prices abroad – among other things financing the magnificent ‘wool churches’ of the Cotswolds and East Anglia – and, in a foretaste of the eighteenth and nineteenth century enclosures, poor subsistence farmers were expelled from the common land to turn large areas over to grazing. The decline in the ‘wool economy’ in the later sixteenth century might lie behind the decision of Corin’s absentee master to sell up. Which they have swallow’d down into their maws. Which said a black sheep was a biting beast. In Greek and Roman mythology, Hymen is the God of Marriage, usually represented as a young man carrying a torch. Whether Shakespeare intended him to descend from on high – as a deus ex machina – at the conclusion to his play, or merely be one of the play’s earthly characters assuming the symbols of his power, is one of the many fascinating choices every production has to make. Betsy Cadwaladyr was born in Pen Rhiw in Wales in 1789. She was sent by her parents to a small-scale local school in Bala. Her father well understood the value of education, as he himself had received no formal schooling. A small farmer and sometime Methodist preacher, Dafydd Cadwaladyr had taught himself to read his native Welsh in the most extraordinary manner. Tending sheep on a mountain, he learned much of the alphabet from the owners’ initials tarred on the sides of the various flocks grazing on the hillside. Afterwards, leafing through the pages of the Llyfr Gweddi Gyffredin (the Book of Common Prayer), he recognised some of the letters, and `finding out their sounds in combination, he taught himself to read in the course of two months’! No early quarto texts of this play have survived – many scholars believe there was no early printing – so our earliest text is that of the First Folio of 1623. The date of composition is uncertain but it is likely to be after Francis Meres’ list of Shakepeare’s plays – in which As You Like It does not appear – was entered in the Stationers’ Register on 7th September 1598. However, as the play itself was entered in the Register in August 1600, it is most likely that it was roughly contemporary with Julius Caesar and Twelfth Night and perhaps written only shortly before Hamlet. However, there remain arguments for placing the play several years earlier, and the possibility that Meres simply missed the play off his 1598 list. As You Like It is a radical reworking of Thomas Lodge’s engaging prose romance, Rosalynde or Euphues’ Golden Legacy (1590) – see the excerpts we print later in this programme. In his turn Lodge was inspired by The Tale of Gamelyn, once thought to have belonged in Chaucer’s Canterbury Tales, an attribution now dismissed by scholars. That poem tells of of Sir Johan of Boundys and his three sons. On his deathbed, and against the advice of his friends, Sir Johan bequeaths most of his property to his youngest son, Gamelyn. However, Gamelyn is a minor and so he and his property fall to the care of the eldest brother who treats Gamelyn like a servant and allows the property to fall into decay. The story is violent and bloody and has no element of romance, but although the poem was not printed until 1721 it is clear that Lodge – and possibly Shakespeare, too – was aware of it and inspired by it. Other possible influences on Shakespeare include a play of 1599, Syr Clyomon and Clamydes (authorship uncertain), Tasso’s play Aminta (1581), Guarini’s Il Pastor Fido (1589) and Montemayor’s Diana Enamorada,translated from the Spanish by Bartholomew Yonge in 1598. It is assumed that Shakespeare took the name ‘Orlando’ for the play’s hero from Ariosto’s Orlando Furioso, perhaps via Robert Greene’s 1592 play, The Historie of Orlando Furioso, though Sir John Harington’s English translation of the original Italian poem was first published in 1591. This romance, in prose and verse, Lodge claimed to have written to while away the hours on a long voyage to the Canaries. As in the play, the romance between Rosalynde and Rosader (Orlando) is the centrepiece, while the parallel romance – that between Phoebe and Montanus (Silvius) – Lodge gives greater prominence than Shakespeare. Lodge’s work is vivid and engaging, though – lacking the range of character that Shakespeare introduced to the story – its tonal range is far more limited. In this humour was Saladyne, making his brother Rosader his foot-boy, for the space of two or three years, keeping him in such servile subjection, as if he had been the son of any country vassal. The young gentleman bore all with patience, till on a day, walking in the garden by himself, he began to consider how he was the son of John of Bordeaux, a knight renowned for many victories, and a gentleman famoused for his virtues; how, contrary to the testament of his father, he was not only kept from his land and treated as a servant, but smothered in such secret slavery as he might not attain to any honourable actions. With that, casting up his hand he felt hair on his face, and perceiving his beard to bud, for choler he began to blush, and swore to himself he would be no more subject to such slavery. Torismond, at this speech of Alinda, covered his face with such a frown, as tyranny seemed to sit triumphant in his forehead, and stopped her with such taunts, as made the lords, that only were hearers, to tremble. This rigorous reply of Torismond nothing amazed Alinda, for still she prosecuted her plea in the defence of Rosalynde, wishing her father, if his censure might not be reversed, that he would appoint her partner of her exile; which if he refused to do, either she would by some secret means steal out and follow her, or else end her days with some desperate kind of death. When Torismond heard his daughter so resolute, his heart was so hardened against her, that he set down a definite and peremptory sentence, that they should both be banished, which presently was done, the tyrant rather choosing to hazard the loss of his only child than anyways to put in question the state of his kingdom; so suspicious and fearful is the conscience of an usurper. Well, although his lords persuaded him to retain his own daughter, yet his resolution might not be reversed, but both of them must away from the court without either more company or delay. In he went with great melancholy, and left these two ladies alone. The birds with sorrow pain them. Oh how would Phoebe sigh if she did look on me! To see her Montan die. Que te sert si grande dépense? C’est trop de flammes pour un coeur. En quel feu je brûle pour elle. Bien qu’elle ait de neige le sein. Montanus ended his sonnet with such a volley of sighs, and such a stream of tears, as might have moved any but Phoebe to have granted him favour. Gerismond, desirous to prosecute the end of these passions, called in Ganymede, who, knowing the case, came in graced with such a blush, as beautified the crystal of his face with a ruddy brightness. The king noting well the physnomy of Ganymede, began by his favours to call to mind the face of his Rosalynde, and with that fetched a deep sigh. Rosader, that was passing familiar with Gerismond, demanded of him why he sighed so sore. At this word Rosader sighed so deeply, as though his heart would have burst. “And to his censure will I stand,” quoth Phoebe. In went Ganymede and dressed herself in woman’s attire, having on a gown of green, with kirtle of rich sendal, so quaint, that she seemed Diana triumphing in the forest; upon her head she wore a chaplet of roses, which gave her such a grace that she looked like Flora perked in the pride of all her flowers. Thus attired came Rosalynde in, and presented herself at her father’s feet, with her eyes full of tears, craving his blessing, and discoursing unto him all her fortunes, how she was banished by Torismond, and how ever since she lived in that country disguised.